Tom McGowan scored the only goal for Stamford AFC at Matlock. A tough week finished in fantastic fashion for Stamford AFC today (October 17). 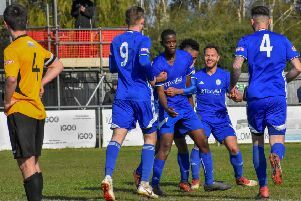 The Daniels picked up one point from two home games before losing skipper Richard Jones to higher-level Boston United, but they won their Evo Stik Northern Premier Division match at Matlock Town this afternoon to climb a place to 22nd in the table. It was a first win for recently appointed Andrew Wilson who had caused a stir in the ranks by surprisingly omitting Jones from his starting line-up. That move was justified today as Stamford won 1-0 and kept a rare clean sheet. Tom McGowan, who returned to the club from Histon earlier this week, scored the only goal of the game against 10th-placed Matlock in the 57th minute. Richard Knight made a superb save late on to keep Stamford in front. Spalding also bounced back from a bad week with a 1-0 win at Goole in Division One South. Jake Newman scored the only goal of this game in the 24th minute to push the Tulips up to seventh in the table, just four days after getting knocked out of the FA Cup and losing out on a lucrative home tie with FC United of Manchester. In the United Counties League, Peterborough Sports continue to turn the Division One title race into a procession. They thumped Lutterworth 5-1 at PSL today to make it 10 wins from 10 games and a four-point lead (with a game in hand) at the top. Sports have amassed some serious firepower for this season including Karl Gibbs and David Cobb who scored two apiece today. Top scorer of them all Avelino Vieira also netted as Sports made it 57 goals in their Division One campaign. The city side did let a fourth goal of the season in though, from the penalty spot as Lutterworth briefly drew level midway through the first half. Blackstones are down to eighth after losing 4-2 at home to Thrapston. Stones twice led in the first-half as Dan Evans and Adam Scotcher found the back of net, but the visitors scored three unanswered goals in the second half. Holbeach United are 10 games unbeaten and closing in on the Premier Division leaders as they bashed Wellingborough Town 5-0 in front of a crowd of 119 at Carter’s Park. Andrew Tidswell bagged a hat-trick, starting with a penalty, after Jordan Thomas had scored the first two goals. The Tigers are now fourth in the table, nine points behind leaders Leicester Nirvana with three games in hand. Nirvana lost for the first time this season today, 2-0 at home to lowly Eynesbury. Peterborough Northern Star are also on the march. They made it five wins in a row after pipping lowly Huntingdon 2-1 at Chestnut Avenue. Craig Smith claimed the decisive goal just after the break after Jacob Joyce had shot Star into an early lead. Deeping Rangers are lurking just behind the leading pack after securing a sixth win in 10 matches, 1-0 at Desborough. David Burton-Jones was the match-winner after 17 minutes. Yaxley are heading in the wrong direction as they lost for the second game in a row, this time 1-0 at Rothwell Corinthians. Wisbech won for the first time in eight matches as Matt Sparrow claimed the only goal of the game in the 25th minute at Newport Pagnell.